Frris' Transmission Equation is an equation that shows the relationship between the received power and various factors influencing the received power. To get a clearer understanding, let's think of a communication system that is made up of one transmitter RF front end and one reciever front end as illustrated below. Left side shows Transmission RF Front End. Gt represents the gain of the transmission antenna, PA represents a power amplifier and Pt is the power measured right before the transmission antenna. Right side shows Reciever RF Front End. Gr represents the gain of the reciever antenna, LNA represents a low noise amplifier and Pr is the power measured right after the reciever antenna. d stands for the distance between the transmitter and reciever antenna. lamda (not shown in the illustration) stands for wave length of the signal. As you know, lamda can be expression as 1/f (1 / frequency). With all of these variables (factors), the received power (Pr) can be estimated by the equation shown below. This is Frris' Transmission Equation. Recieved Power is proportional to Reciever Antenna Gain (Intuitive). 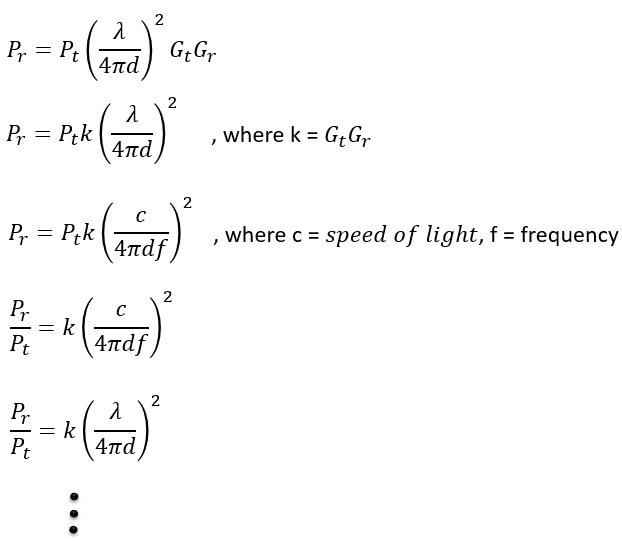 Recieved Power is proportional to Wave length of the signal (more accurately wavelength squared). It means Recieved Power is Anti-proportional to frequency. As frequency goes higher, received power goes lower when the same power of signal is transmitted. If you represent the same equation in linear scale, it can be represented as follows. As I said, the equation shown above is in dB scale meaning 'Log' scale. If you convert the Log scale into linear scale with high school math, you should get the following equation. By rearranging this equation, you can represent the same equation in many different forms as shown below. You would see many different form of this equation on various different document. It would take some time until you realize all those seeminly different equation basically mean same thing. (You can see an application of this equation in Path Loss Model in Free Space in Fading page).